So many veggies in one delicious meal! 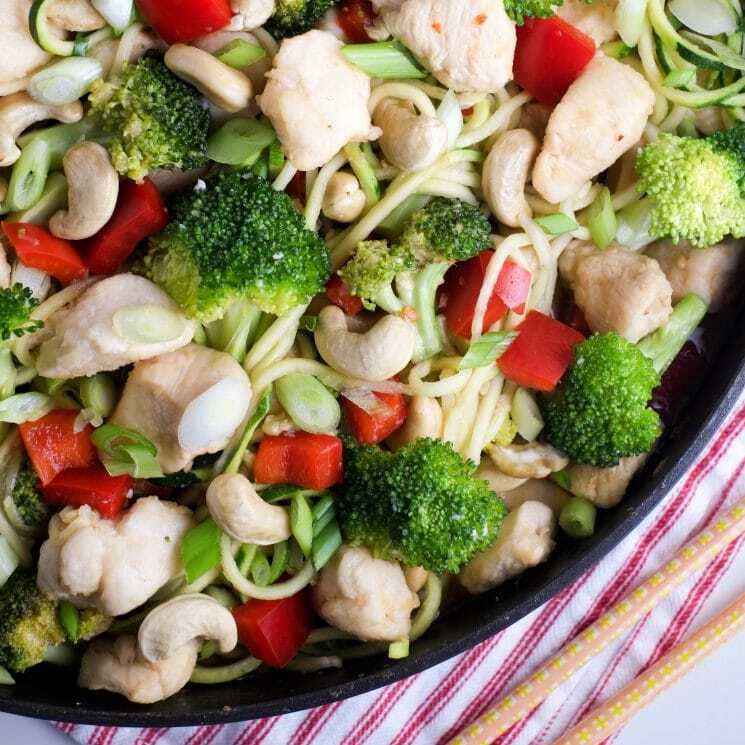 Cashew chicken is a kid-pleasing dish that is easy to prep ahead, and now with zoodles it just got healthier (and more fun!). 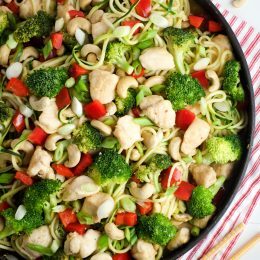 Cashew chicken zoodles pack in lots of protein and lots of veggies! I’ve recently had two different friends mention that cashew chicken is one of their family favorites. Maybe it was just a big coincidence, but it gave me inspiration. 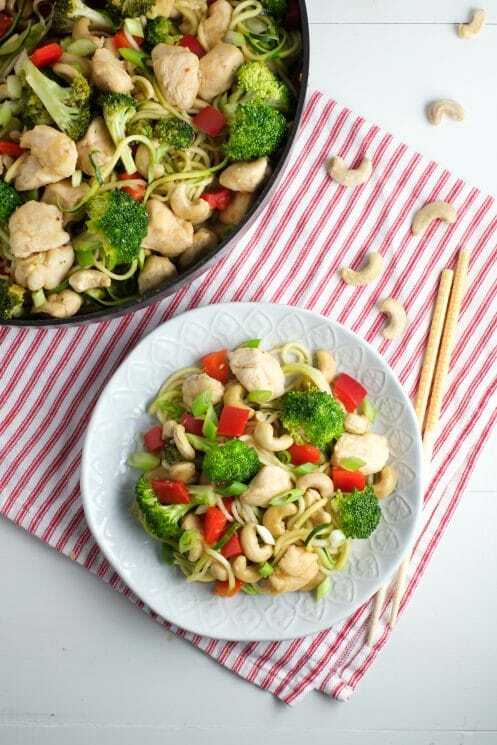 Cashew chicken is traditionally a fairly heavy dish – with both chicken and cashews, plus rice. So I thought, why not zoodles? Especially once it comes on in full force this summer and everyone wants recipes for how to use up zucchini. 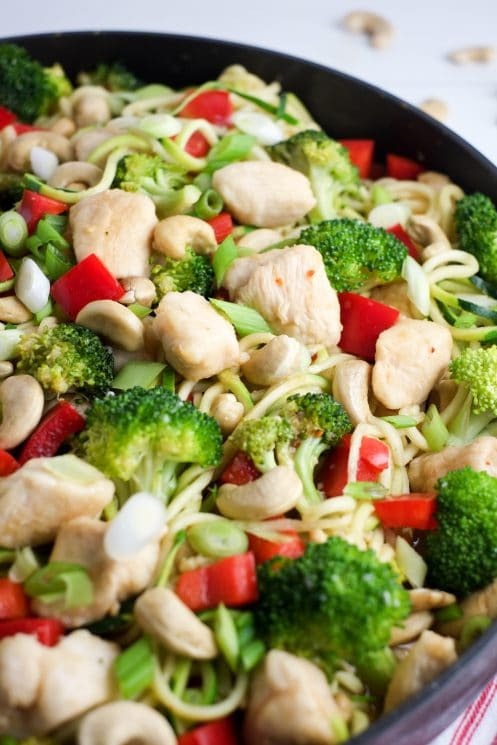 Not all cashew chicken comes packed with veggies, but we made sure to! Red pepper and lots of broccoli – plus the zucchini, of course! 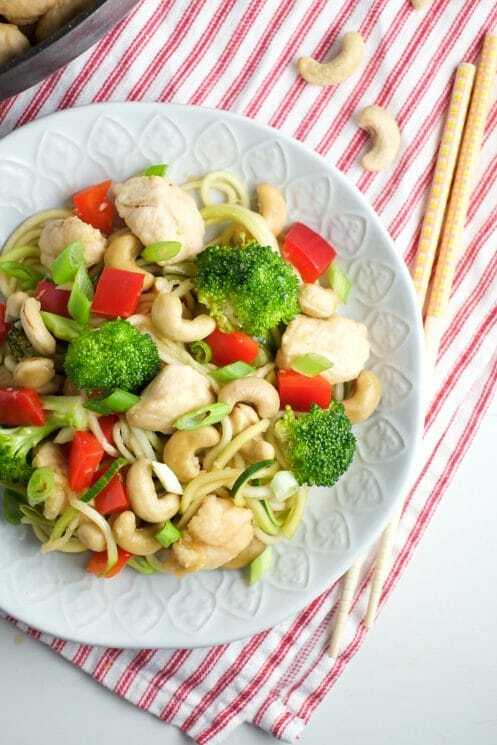 Cashew chicken is high in protein because it includes both chicken and cashews (hence the name). Cashews also contain healthy fats for good brain health. We decided to make the dish a little lighter (and more veggie-packed) by replacing rice with zoodles. 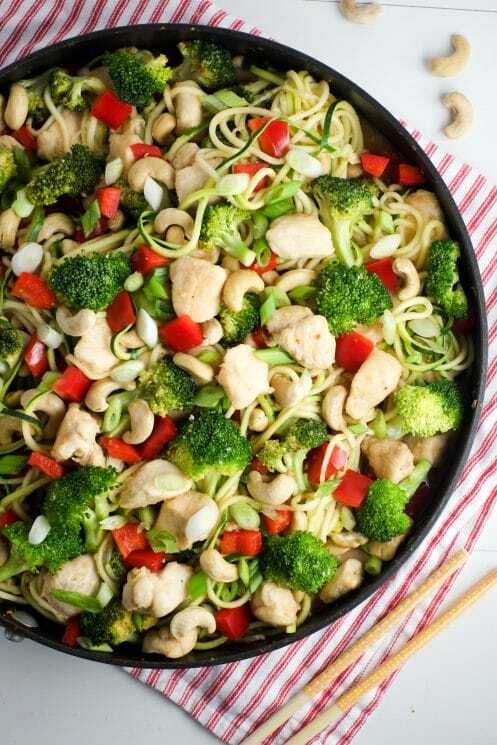 Though we love brown rice, we thought zoodles would work nicely with the other calorie-dense items in the recipe. The result? A filling and satisfying dish that doesn’t leave you feeling overly full. And everyone getting in their veggies! This meal is fantastic because it can pretty much all be prepped ahead! Wash and chop the red bell pepper and large head of broccoli into small pieces (especially the broccoli- so it cooks quickly) and store them in airtight containers. Spiralize 3 medium zucchinis and store them in something airtight too. Slice a bunch of green onions (about 6) and bag them up for later. Now you need about 1 pound of chicken breast. Cut the chicken into 1-inch cubes and toss into a large ziplock bag. Later you’ll add some corn starch to coat them, but wait until right before you cook. 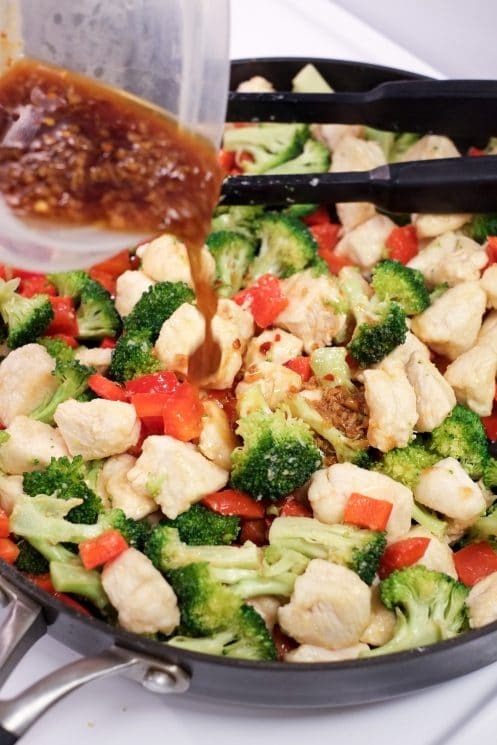 Finally, whisk together the sauce: 1/4 cup low sodium soy sauce, 2 tablespoons rice vinegar, 2 tablespoons honey, 1 tablespoon grated fresh ginger, 3 minced cloves of garlic, and an optional 1/4 teaspoon of red pepper flakes. 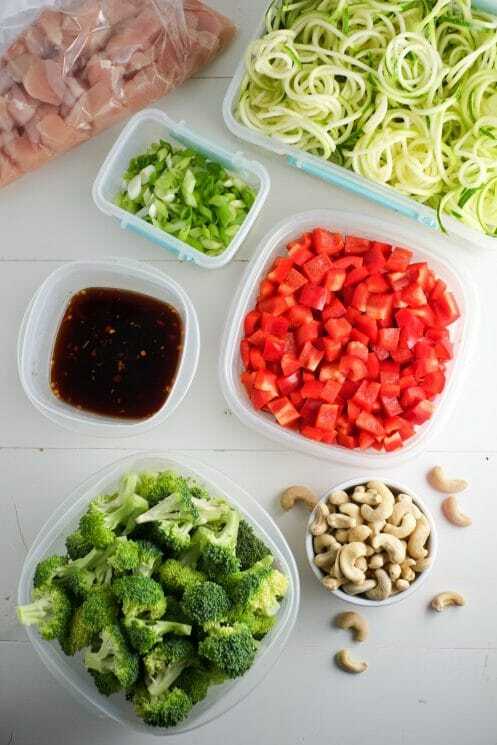 When it’s time to make dinner, just grab your prepped food as well as some olive oil and corn starch. Add 2 tablespoons of corn starch to the bag of chicken, seal it up, and toss it around until the chicken is evenly coated. Now whisk 2 tablespoons of corn starch into the soy sauce mixture you made until there are no lumps. Heat a very large skillet or wok over medium-high heat. Add 2 tablespoons of olive oil. Dump the chicken in and saute for 5 minutes, until most of the sides are no longer pink. Add the broccoli and red bell pepper. Saute for another 5 minutes. Then pour in the sauce and bring to a simmer for another 5 minutes. Once the chicken is cooked, the veggies are partially soft, and the sauce is thickened a little, add the zoodles. If it’s anything like my experience, they will seem not to fit at first, but just add as many as you can and carefully stir. 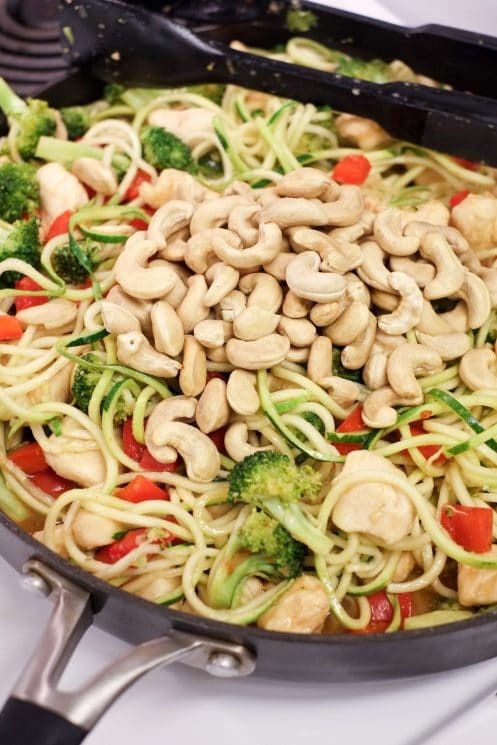 Once the zoodles are incorporated and slightly softened, add one cup of cashews and remove from the heat. Sprinkle with green onions. 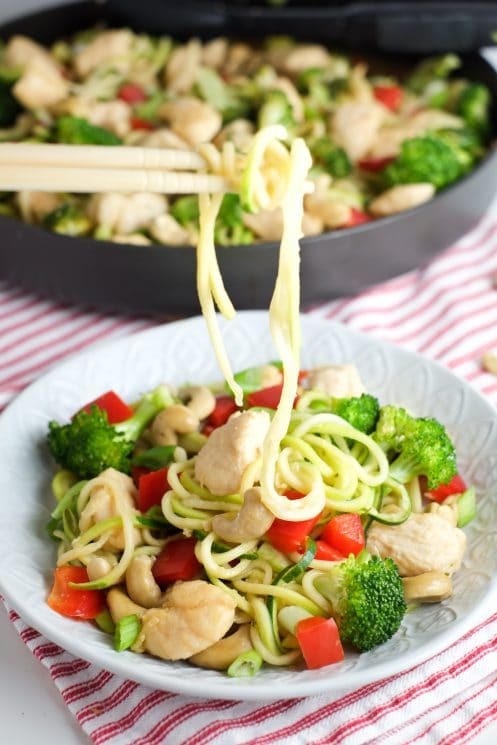 If you’re not a fan of zoodles, just skip them and serve the cashew chicken over brown rice. Zoodles are just more fun to slurp! Chop broccoli and red bell pepper into small pieces. Slice green onions. Mince garlic and grate ginger. Spiralize the zucchini. Whisk together the sauce (if preparing ahead of time, wait to add the cornstarch until just before cooking): soy sauce, rice vinegar, honey, garlic, ginger, red pepper flakes, and cornstarch. Cut chicken into 1-inch cubes. Toss with 2 tablespoons of corn starch in a plastic bag just before cooking. In a large skillet or wok, heat 2 tablespoons of olive oil. Saute chicken until most edges are no longer pink. Add broccoli and red bell pepper and stir fry for 5 minutes. Pour sauce into the skillet and continue cooking for 5 more minutes, until everything is cooked and the sauce has thickened a bit. Carefully add zucchini noodles, mixing in and cooking just a few minutes. Stir in cashews and remove from heat. Garnish with green onions.